In the third issue of the Journal for European Environmental and Plannning Law (JEEPL), Nicole Kranz, Benjamin Görlach and Eduard Interwies published an article on the selection of cost-effective combinations of measures according to Article 11 of the Water Framework Directive (WFD). The article highlights the results of the project "Basic principles for selecting the most cost-effective combinations of measures", conducted by Ecologic in 2003 for the German Federal Environmental Agency. In the context of this project and for the first time in Europe, a methodology was developed to ensure more transparency in the process of selecting cost-effective measures in the context of WFD-implementation. According to the EC-Water Framework Directive, all river basins in Europe need to attain a ‚good ecological status' by 2015. To this purpose programs of measures are to be developed for each river basin until 2009. The selection and combination of measures in the context of these programs is to be based on cost-effectiveness criteria. While cost considerations are common practice in the water sector, the WFD establishes a new approach as regards the selection and combination of measures, as it requires that not only the individual measures but rather their combinations need to be assessed with respect to their cost-effectiveness. Also, the effectiveness of these measures is not assessed based on single parameters (such as N and P concentrations), but on an entire suite of parameters defining the ‚good ecological status' of a water body, including its morphological as well as ecological quality. Finally, cost-effectiveness of measures is not only to be reached locally but rather on the scale of the entire river basin. For selecting and planning concrete measures, the Handbook developed by Ecologic suggests a detailed metholdology in seven steps. Furthermore a selection of possible measures and instruments is provided in the annex of the handbook. Kranz, Nicole; Benjamin Görlach and Eduard Interwies 2004: "Making the Right Choice - a Methodology for Selecting Cost-Effective Measures for the Water Framework Directive". 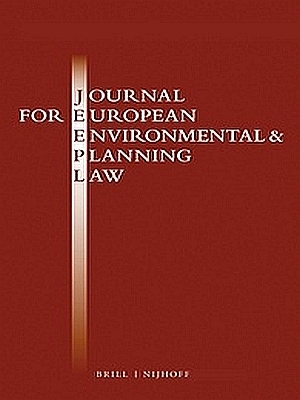 Journal for European Environmental Planning Law, Vol. 1, No. 3, 228-233.